This modern-era color print is one of Mike Lyon’s very favorite in a collection full of remarkable works on paper. It was on his wish-list for years before he located an impression available for purchase, around 2005. Created in an edition of only 200 prints, Mayazumi was a special production requiring unusually high technical skill, especially for the saturated red background achieved through multiple printings of the color. The publisher Watanabe Shōzaburō (1885-1962) commissioned and issued the edition in 1928, more than 10 years after he had coined the term “shin hanga” [new print] in the process of reviving the old methods of ukiyo-e printmaking. Watanabe re-instituted the close collaboration of publisher, artist, carver, and printer that defined the traditional production of earlier eras. Shinsui designed prints for Watanabe from 1916 when the publisher saw the young artist’s work displayed in Kaburagi Kiyokata’s (1878-1973) art academy annual student exhibition. Not only did the publishing house espouse the production methods of the past, it also favored the same genres of prints popularized in the Edo period (1600-1868): landscape, actor portraits, and pictures of beautiful women (bijin-ga). During his long career working with Watanabe, Shinsui experimented with a variety of subject matter, styles, and certainly color palettes but by 1922 he had settled into painting bijin-ga as his primary subject. His portrait heads were considered his best work, blending traditional ukiyo-e design that was dependent on strength of line with contemporary fashion of the modern age. Mayazumi [Eyebrow Ink] exemplified this and in 1928 it was an instant critical and commercial success, selling out the entire edition very quickly. This private glimpse of a female actress applying make-up before a barely-seen mirror in preparation for a performance encompasses all the best elements of Japanese printmaking. Shinsui was recognized as a master artist in his own time, as in 1952 his artwork was declared an “Intangible Cultural Property” and in 1970 he was awarded the “Order of the Rising Sun,” both significant gifts from a grateful nation. "[This] print, a commercial and critical success, differed from Shinsui's increasingly staid bijin pictures of the late 1920s in its horizontal format, technical skill in the multiple printings required for the saturated color, and theatrical subject. A similar Shinsui painting of 1924 used the actress Kawada Toshiko as its model, and Eyebrow Pencil may have been based on that painting. A comparison with a contemporary photo of a kabuki onnagata shows at once Shinsui's exacting naturalism and his manipulation of the formal contrast between the saturated vermilion background and the alabaster skin of the actress." Quoted from: Shin-Hanga: New Prints in Modern Japan by Kendall H. Brown and Hollis Goodall-Cristante , p.63. There is another copy of this print in the National Museum of Modern Art, Tokyo. 1) In color over two pages in 伊東深水全木版画 (All the Woodblock Prints of Itō Shinsui, Machida City Museum of Graphic Arts, 1992, #46, pp. 74-5. 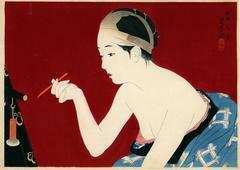 2) In a small black and white image in Modern Japanese Prints by Dorothy Blair, Toledo Museum of Art, #21. The catalogue entry notes that this print was published in an edition of 200. 3) In color in Fresh Impressions: Early Modern Japanese Prints, 23, p. 95. 4) In color in 原色浮世絵大百科事典 (Genshoku Ukiyoe Daihyakka Jiten), vol. 10, p. 33. 5) In black and white in Japanese Woodblock Prints: Tourist Library vol. 10 by Shizuya Fujikake, 1953 edition, p, 82.